Often times doctors “spend” more on patients’ care even if they have more cost-effective alternatives. They are incentivized to. This affects taxpayers. Too often, we easily assign blame to particular people, industries, and/or stakeholders without analyzing what the forces of human nature would drive any of us to do if we were in the same position. Maybe before finding someone or some institution “guilty,” we should first try to understand if a case can be made for “misaligned incentives.” (If you follow healthcare regularly, you probably see or hear this term in about every other article/healthcare-related conversation you have, but just bear with me….) In other words, the question we should ask ourselves is if we were in the same position as our potential target of accusation and judgment, would(n’t) we be “incentivized” to do the same thing? Being in healthcare, one line-item especially stood out to me: Medicare Tax. At a high level, majority of us know that we pay this tax to ensure that “reasonable and necessary” medical care can be delivered to senior citizens in our society. Digging into what’s “reasonable and necessary,” and thus what may affect how big that tax number on our pay stub is, is where a story forms. A recently published Washington Post article, “An effective eye drug is available for $50. But many doctors choose a $2,000 alternative,” tells this story quite well. I’ll give my spin on it. Under current law, Medicare must cover treatment that is deemed reasonable and medically necessary by a physician or other provider. In other words, technically speaking, if a treatment, let’s say a blue pill, that “costs” $2,000 is deemed “medically necessary” for a patient by a physician, Medicare (and thus tax-payers) must pay for it. Okay that’s fine — contributing an extra few dollars out of my paycheck to take care of our elderly sounds super reasonable and honestly makes me feel really good as a young guy that I’m doing my part. 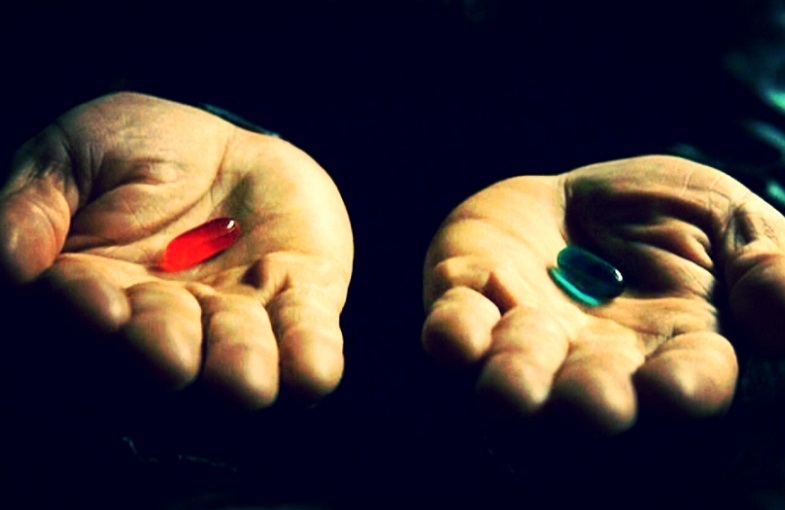 No brainer— Doc should choose the red pill for treatment, right? The “system” should reward Doc for choosing the red pill, right? And we all save a few dollars in our paychecks, right? Doctors… may benefit when they choose [a] more expensive drug. Under Medicare repayment rules for drugs given by physicians, they are reimbursed for the average price of the drug plus 6 percent. That means a drug with a higher price may be easier to sell to doctors than a cheaper one. critics say, Medicare has [to]… pay up. While there are other considerations that lead to doctors choosing the more expensive drug not outlined here (see the full article below), in this example, it is clear that “incentives,” via physicians being rewarded for higher costs or, more obviously, the pharma company being rewarded for higher pricing, can affect the amount of Medicare Tax that comes out of our paychecks. It’s often difficult… to know when two drugs are equivalent. Misaligned incentives or is / are the pharma company / physicians to blame?